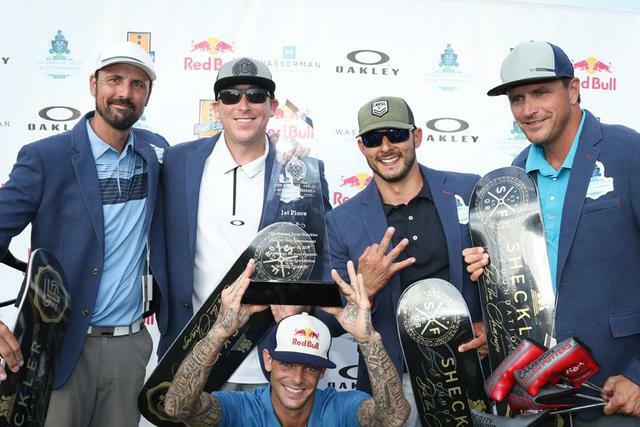 DANA POINT, Calif. (KGTV) – Over the weekend, hundreds of people, celebrities, and professional athletes participated in the Sheckler Foundation's 3rd annual Gala and 10th Annual Celebrity Golf Tournament, held at the Monarch Beach Resort & Golf Links. The two-day event sponsored by Oakley raised $300,000 for the “Be the Change” initiative which contributes to the many causes that benefit and enrich the lives of children and injured action sports athletes. Those in attendance included Machine Gun Kelly (MGK), Avenged Sevenfold, three-time NBA All-Star Klay Thompson, and professional football players, Reggie Bush and Ryan Mathews. "This is my third Sheckler Tournament, it's always a great time for a great cause," Klay Thompson told 10News. Saturday night kicked off with a red-carpet gala complete with a cocktail reception, hor d'oeuvres, and live music. Following the reception, guests enjoyed a gourmet dinner, live auctions, and an award ceremony honoring Ryan's agent, Steve Astephen. On Sunday, festivities continued with a vintage nautical themed Golf Tournament complete with a putting contest sponsored by Red Bull, hole activations, contests, games and entertainment along with food served by Chronic Tacos, Zebra House Coffee and Wienerschnitzel. Reggie Bush and his team took home third place; second place went to Matt Sanders of Avenged Sevenfold’s foursome and Former MLB pitcher, Clay Hensley and his team took home first. Sponsor Lume Cube was awarded Best Hole Activation with a nautical-themed slingshot game. Following the tournament, golfers enjoyed cocktail hour featuring raffles, awards ceremony and the Find Your Grind 200-ft. helicopter ball drop. Sara Peterson from Zebra House Coffee won $3730 from the helicopter ball drop and donated all of her winnings back to the foundation. This year, the Sheckler Foundation donated 100% of the proceeds from the ball drop to help the victims of Hurricane Harvey. Master Plan Communications, Inc. contributed to this article.